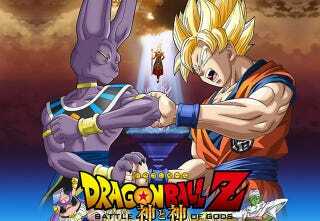 More than a year after its release, Dragon Ball Z: Battle of the Gods is finally coming to the U.S. And better yet, it's coming to us like never before — in theaters. This should be exciting news to U.S. anime fans, if only because we rarely get to see anime on the silver screen. It's set to show in select theaters on August 5th through the 9th which makes it the perfect summer action-flick. I'll be there (on my birthday!) shoveling popcorn in my mouth while cheering with elation as Goku saves the Earth again. If you're on the fence about whether to bother, check out Richard Eisenbeis' review over on Kotaku. For more information, you can check out the DBZ website (also there's a YouTube trailer). There's no information on which theaters will hold showings, but there's sure to be one nearby. There just has to be. This isn't another Tom Cruise action blockbuster — this is Dragon Ball Z!